Reward / Immunity challenge: "Swing Break" - Tandang wins easily, then with one lucky backswing, Jeff Kent and Kalabaw crush both a pot and Matsing's dreams of avoiding Tribal Council just this once. 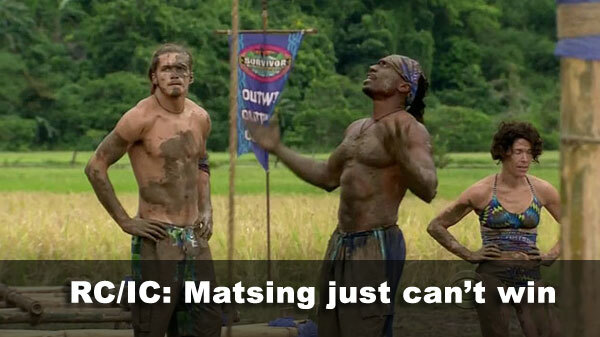 Voted out: Russell, 2-1 over Malcolm. Notes: Fairly standard scoring again, although we would like to salute Dawson and Abi-Maria, who, thanks to the combined RC/IC format and Matsing's unrelenting challenge ineptitude, have now gone seven straight days (three full episodes) without appearing in a challenge. 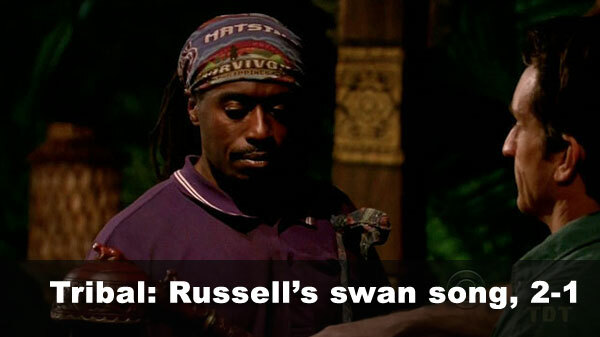 - Russell received 2 votes, from Denise and Malcolm (voted out, 2-1). - Malcolm received 1 vote, from Russell.